hypnocoffee; coffee roaster, coffee bar: Got A Complaint? 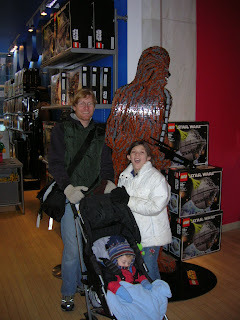 Archival photo of Charlie, Chloe, and I posing with a wookie. And so the weekend which was supposed to be all rain, turned into a warm sunny affair with brief, but blustery rainstorms in the early evenings. As summer creeps ever-closer you'll be seeing more of our scurvy crew, and I feel it is time to appoint a new director of our complaint department. I can't think of anyone more qualified to lend an ear, hear you out, and then tell you to shut-up and drink your damn macchiato than Bish. Congratulations Barbara! I neglected to write this earlier in the week and I'll be damned for it, but Wednesday Gretchen took her first steps, and yes, she was in the coffee shop. Uncle Mackie and Uncle Gary were aboard and shared in the clumsy first strides. I, however, was on the poop deck assembling wrought iron chairs and didn't see my wee-girl walk until the following day. Good work Gretchen! Was this on our trip to New York? mmm... look at that hot wookie.